Lots of those cuts aren't offset, meaning they'll add to the federal budget deficit. 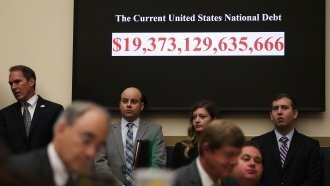 A spending bill passed by Congress on Monday includes $31 billion in tax cuts, according to The New York Times. Some of those cuts reportedly aren't being offset by tax increases or spending cuts, so they'll contribute to an already massive federal deficit. This information may come as a surprise, considering the discussion around the spending bill largely focused on disagreements over immigration legislation. The GOP passed a $1.5 trillion tax overhaul package in December, and the Congressional Budget Office said earlier this month the government already had a $228 billion budget deficit. Cuts included in the tax plan and upcoming cuts from the spending bill will likely grow that deficit.